PT Rajawali Nusindo - Nusindo or referred to as "Rajawali Nusindo" is a well-established trading and distibuting company in Indonesia. Rajawali Nusindo has business competencies as a distributors of pharmaceutical and medical equipment, agricultural products, and also general products. PT Rajawali Nusindo is a directly-owned subsidiary company of PT Rajawali Nusantara Indonesia (Persero) or RNI Group, a leading state-owned diversified business group in Indonesia. At present, PT Rajawali Nusantara Indonesia (Persero) holds 99.999% shares in Rajawali Nusindo. Othe 0.001% was owned by PT Mitra Rajawali Banjaran. Based in Jakarta, Rajawali Nusindo now has 43 branch offices spread across Indonesia. Rajawali Nusindo’s business results in 2015 showed improved performance compared to 2014. Rajawali Nusindo recorded a very satisfactory profit in 2015. According to PT Rajawali Nusindo Annual Report 2015 as cited by JobsCDC.com, Rajawali Nusindo booked total net profit of Rp 6.32 billion in 2015. This figures reflected a 394.65% growth from total net profit in 2014 of Rp 1.27 billion. Male/Female, not older than 27 years of age (single/not married). Minimum background in Diploma Degree (D3). The candidate with prior experience minimum of 1 year in the field of marketing is preferred. JobsCDC.com now available on android device. Download now on Google Play here. Please be aware of recruitment fraud. The entire stage of this selection process is free of charge. 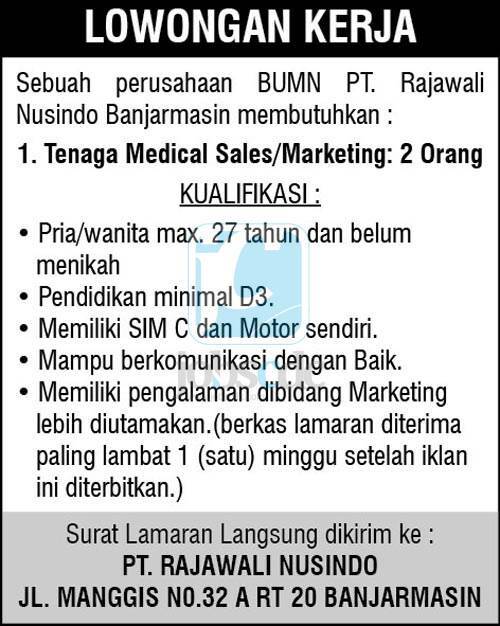 PT Rajawali Nusindo - D3 Fresh Graduate, Experienced Staff RNI Group January 2017 will never ask for fees or upfront payments for any purposes during the recruitment process such as transportation and accommodation.